Every year, millions visitors travel through Nashville enjoying the sights and sounds of Music City. Of course, this figure only represents the two-legged tourist count. The Visitors & Convention Bureau doesn’t actually keep track of the four-legged visitors who “hightail” it here annually to sightsee along with their humans. While Nashville is famous for its stargazing possibilities, you may see Kellie Pickler or Taylor Swift walking their dogs (and cats)! But not everyone who comes to town carries a guitar or dreams of their name in lights. 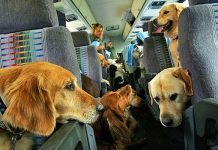 Some just carry their suitcases and leashes, knowing Nashville is a friendly, easy-going city where sophistication and charm blend with a down-home mix, and where—to borrow a phrase — every dog can have its day. Visitors who bring pets to Nashville are frequently surprised by the astonishing amount of things to do. 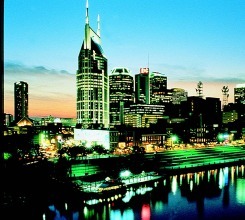 Nashville is often referred to as a “big small town.” The description fits. It is a major center for country music, of course, but it is an explosion of other cultural attractions as well. For instance, you might tour RCA’s historic Studio B, take in a Broadway musical at the Tennessee Performing Arts Center, visit the restored Ryman Auditorium where the real “Nashville Cats” used to play each weekend on the Grand Ole Opry. You might get a short history lesson at the Tennessee State Capitol (built in 1859), and then stop for a snack at Planet Hollywood or the Hard Rock Café. You may choose to tour the Hermitage, home of President Andrew Jackson, then float down the Cumberland River from Opryland on the General Jackson Showboat and stroll through Cheekwood’s botanical gardens before heading inside to see the latest art exhibit. Don’t forget to tour historic Belle Meade Mansion, found in the heart of one of Nashville’s toniest neighborhoods. 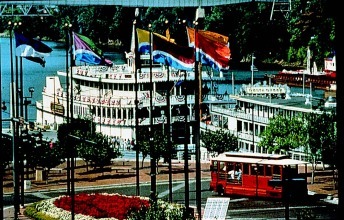 If that’s not enough, there’s also the Bicentennial Mall, the Nashville Zoo at Grassmere, and the Country Music Hall of Fame & Museum— one of the city’s most popular tourist destinations. You can dine in four-star restaurants or catch the blue plate special at one of the city’s popular “meat’n’threes,” catch up-and-coming singers/songwriters in the round at Bluebird Café, gawk at country celebrities along Music Row (while your pooch checks out RCA’s canine mascot ‘Nipper’), or take a whirl on the Tennessee Fox Trot Carousel, created by renowned sculptor Red Grooms. (Why not turn the tables for the ultimate revenge: one of the colorful carved characters you can ride on this whimsical merry-go-round is a flea!) Sports fans lucky enough to find tickets for the always sold-out games can cheer on the Tennessee Titans at Adelphia Coliseum, or catch “fang fever” with Nashville’s own NHL hockey team, the Predators. Eastland Cafe – features a Lappy Hour, where pet owners can bring their dogs on the patio and enjoy discounted cocktails and appetizers. A percentage of the proceeds go to the Nashville Humane Association. Now that your day is filled with sightseeing possibilities, what about Fido’s and Fluffy’s agenda of activities? Don’t worry, there’s plenty to fill up their memory scrapbooks as well. From upscale accommodations to doggie day-care, pet boutiques to spa salons, agility training to outdoor recreation, your four-pawed pals will have a field day too. With just a bit of advance planning, both you and your pet can enjoy a doggone good time in Music City. Loews is one of the most pet friendly hotels in Nashville, and you’ll realize it from the moment you and your pet check in. All pets receive pawsome gifts, including a pet tag, bowl and a special treat to start their vacation. Owners receive a detailed brochure with information on our Tennessee pet friendly hotel services. Some of the services are our Loews Loves Pets room service menu, local dog walking routes, and area pet services, including veterinarians, pet shops, groomers, and much more. At Hutton Hotel, luxury has truly gone to the dogs. Introduce your favorite furry or feathered friend to our Nashville pet friendly hotel, set in the heart of the city’s fashionable West End neighborhood. To help keep Fido or Fluffy entertained during their stay in Music City, we’ve designed a special Happy Tails Pet Program, featuring exclusive pet perks like water and food bowls, comfortable beds and even an exclusive welcome amenity. Discover the warmest, most sophisticated pet friendly hotel in Nashville TN, and share your travel experience with your beloved canine or feline companion. 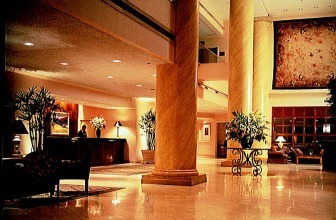 The only five star hotel in Tennessee has been located right in the heart of Music City for over 100 years. It has been named “Best Pet Friendly Hotel” by TripAdvisor users. You won’t want to miss a leashed stroll through Centennial Park (directly across from Vanderbilt University), featuring the world’s only full-scale reproduction of the Parthenon. Inside stands a 42-foot sculpture of Athena. Outside, Rover can chase a ball, watch you feed ducks on the lake or join you for a swing. In warm weather, bring a blanket, sit out under the stars and enjoy a Shakespearean production at the Centennial Park Bandshell. Dogs are welcome, though stuffing a few treats in your pocket to keep them quiet through the third act would probably be a pretty good plan. One of Nashville’s best-kept secrets is Warner Park, a 2,700-acre recreational area on the west side of town which offers miles of stunning nature trails, picnic areas and sections of paved roads where no vehicular traffic is permitted. Pack a picnic lunch, hike a trail, glimpse a deer, stop to chat with other dog owners and view the city from one of the scenic overlooks. Then drop by the new Warner Park Nature Center where a friendly park ranger just may pull out a handful of doggie biscuits for Fido’s enjoyment. Radnor Lake is another ‘off-limits-to-cars’ wildlife preserve, but it is in the very heart of Nashville. Dogs aren’t permitted on the trail loop that circles the lake itself, but the view from the road is almost as nice. When it’s time for fun, Centennial Dog Park welcomes dogs for off-leash play in a fenced, grassy park. The park even supplies mutt mitts so you can clean up Fido’s messes. Park includes a water fountain for dogs, as well as a separate small dog area. Dogs must be vaccinated and licensed. Hours: Dawn to 8:00 p.m. Dogs are allowed to play off-leash in a designated area of this park, located near the Riverview Golf Course. Bring your pet to run and play off-leash at this fenced dog park, which includes benches for owners to relax on and a doggie water fountain. Riverfront Park, at the downtown end of Broadway, offers more adventure for your canine companion. Situated on the banks of the Cumberland River, this restored outdoor area offers an up-close-and-personal view of the Nashville skyline from its grassy banks, Adelphia Coliseum is across the way, as is Fort Nashborough—a reconstructed pioneer settlement depicting Nashville’s earliest history. The shops and historic landmarks of Second Avenue are just blocks away, and in warm weather months, Riverfront Park is the site for an all-star lineup of free outdoor concerts and festivals. Live On The Green is a free six-week concert series that takes place at Public Square Park near City Hall. The stage is set up on the steps of the Plaza and the crowd gathers in the grassy area of Public Square Park to watch performances from local, regional, and national artists. Each night consists of 4 performances with the first starting around 5 p.m. and the headliner wrapping up around 11 p.m.
No pet’s visit to Nashville would be complete without a stop by a pair of unique stores just a few doors apart in the Green Hills Mall: the Dog Store and the Cat Shoppe, both featuring a wide selection of gifts for you and your four-legged friends. Your canine or kitty can shop for jewelry, accessories, toys and treats, and maybe even “collar” a souvenir or two for friends back home. Afterwards, you can both relax at ‘Fido’ in Hillsboro Village. Once a popular pet shop, now a coffee bar/restaurant, Fido honors its heritage by boasting a menu of dog-monikered drinks. Tables and chairs on the sidewalk let you and Rover bond over a cup of cappuccino and a Milk Bone. Offers Nashville’s original Holistic Pet Food Supplier and Self Serve Dog Wash. We proudly offer a wide variety of holistic food and treats for both dogs and cats. If we don’t have what you’re looking for, we’ll do our best to get it for you. Provides quality lifestyle products for all dogs and their families. Their mix of upscale products and casual living attitude come together to create a brand that every dog can enjoy. They cater to all dogs – small and large, tall and short, pedigree and mutt – no one is left out. Products are even made in Nashville, TN. 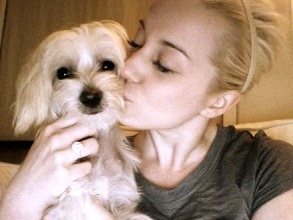 See Spot Eat was founded because the owners wanted other dogs in Nashville (besides their own!) to be able to not only have access to freshly made, healthy, and YUMMY homemade treats, but also to offer a place where their people can come for high quality pet foods and other supplies that they can feel good about giving their dogs. They offer a place where dogs and their people can get something to eat. Places like this aren’t easy to find in Nashville. So, to this end, right next to their location is the Pied Piper Creamery! So, if you’re looking for an ideal, pet-friendly destination, Nashville could be the place. Besides, who knows? Your bloodhound’s howl or cat’s meow might turn out to be the hot new sound some big record executive is looking for. Your pet just might be the next Nashiville Star! Some other popular spots for pups include Camp Bow Wow and The Dog Spot when your in need to take a night off in this historic Music City! Previous articleSummer Break? Holiday Volunteer Vacations: Help Animals On Your Next Getaway! 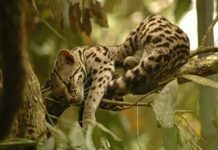 Help Save The Endangered Belize Jaguars! Traveling To New Heights With Your Furry Friend!